The Bishop of Birmingham, the Rt Rev John Sentamu, has become the Church of England's first black archbishop. The Ugandan-born cleric takes over as Archbishop of York from Dr David Hope who quit in February to become a parish priest in Ilkley, West Yorkshire. 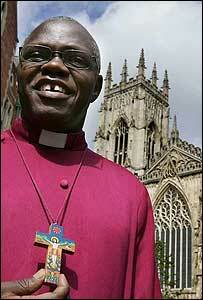 Bishop Sentamu said his appointment to the second-highest post in the Church of England was "an exciting prospect". He added that the Church needed to regain its vision and confidence and be ready to take risks. At a news conference, Bishop Sentamu said he looked forward to working with the Archbishop of Canterbury Dr Rowan Williams to spread the Christian message. "It is imperative that the Church regains her vision and confidence in mission, developing ways that will enable the Church of England to reconnect imaginatively with England." Asked if this meant the Church had lost its way in recent years, he responded: "We just need to reconnect, we just need to revitalise ourselves, we just need a fresh vision." Dr Williams welcomed the news and praised the bishop's efforts to combat racism. Bishop Sentamu worked on inquiries into the 1993 racist killing of Stephen Lawrence and the stabbing of Nigerian schoolboy Damilola Taylor in 2000. Dr Williams said: "He is someone who has always combined a passion for sharing the gospel with a keen sense of the problems and challenges of our society, particularly where racism is concerned." The 56-year-old was educated in Uganda, where he practised as a barrister and was an outspoken critic of Idi Amin's regime, before coming to the UK in 1974. He was ordained in 1979, serving as assistant chaplain at Selwyn College, Cambridge. From 1979 to 1982 he was chaplain at HM Remand Centre Latchmere House and curate of St Andrew's Ham, Southwark, south London. After serving in a succession of London parishes, he was appointed Bishop of Stepney in 1996 and Bishop of Birmingham in 2002. In Birmingham he has been a prominent campaigner on gun crime and also worked closely with MG Rover workers after the car firm collapsed. The bishop and his wife Margaret have two grown-up children, Grace and Geoffrey. City of York MP Hugh Bayley, who worked with the then Bishop of Stepney on anti-poverty initiatives when he was a social security minister in the late 1990s, welcomed his appointment as Archbishop of York. "I think it is an excellent appointment for York and for the Church of England," said Mr Bayley. "I know from work I have done with him in the past that he has a strong commitment to tackling poverty in the UK and I hope that he will bring that to his work in the north of England." Bishop Sentamu's, whose appointment was made by the Queen on the recommendation of Prime Minister Tony Blair, is expected to move to York in the late autumn.